It seems like ages ago that the blogosphere was abuzz with a debate over the value of telephone/in-person interviews. At the core of the debate were Wired Magazine‘s Fred Vogelstein, Jason Calacanis, and Dave Winer. Vogelstein had asked Calacanis and Winer for interviews, and each had suggested that they’d be happy to answer questions via email, but would not do a telephone interview. But Vogelstein wasn’t working on a story about Calacanis or Winer. 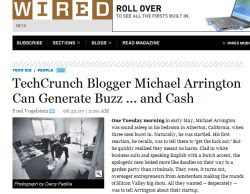 He was writing a profile of TechCrunch founder Mike Arrington. That article was finally released this weekend. As a journalist, I understand Vogelstein’s position. Nothing replaces a live and spontaneous discussion. In fact, I was in a similar situation recently. I was attempting to conduct an interview with someone who had bad cellphone reception. He suggested I could give him a list of questions, and he would respond to them. I had to convince him that I wasn’t trying to surprise him with my questions, but rather that I wanted to be able to respond to his answers. I tend to write down a few questions before most interviews, but most of the questions I ask are follow-ups prompted by the responses those first few questions get. Anyway, the story got even more complicated, as Calacanis agreed to do the interview as long as he could record it and release the full text as a podcast. The dialog provided a peek behind the scenes at conventional blogging and journalism. Vogelstein was put in the interesting position of having the whole world know what he was writing about months before the article would be hit newsstands. While this is the sort of thing that could lead pundits to proclaim that traditional journalism is dead, Vogelstein responded that he would hope that his contacts, interviews, and overall skills as a reporter would allow him to write a story that people would still want to read several months down the road. And the truth is, Vogelstein’s article is good. Very good. It’s longer and more detailed than anything you’ll read on most blogs. But it also includes more anecdotes, interviews, and analysis. If anything, the trend towards niche bloggers breaking news about tech company mergers or details of the latest Harry Potter release might one day take the pressure off of traditional news organizations to be the first with a scoop. I’d love to live in a world where you can turn to blogs for breaking news and analysis and sit back with a good magazine, newspaper, or public radio story for some stories behind the headlines. Incidentally, one of the fun anecdotes Vogelstein included in his article is the tale of some enthusiastic folks with the Web 2.0 company Fleck who beat a path to Michael Arrington’s door one day in May. They apparently were so interested in meeting with the kingmaker that they were willing to risk waking him up.